American UN Ambassador urges India to reconsider its ties to Iran as fresh U.S. sanctions on buyers of Iranian oil loom. Nikki Haley, the United States Ambassador to the UN, on Thursday urged India to reconsider its ties to Iran, one of its key energy suppliers, as fresh U.S. sanctions on buyers of Iranian oil loom, AFP reported. The State Department has asked its allies, including India and China, to cut all imports of Iranian crude oil by November 4, which is when U.S. sanctions are scheduled to resume in the wake of President Donald Trump’s withdrawal from the 2015 Iran nuclear deal. India imports the overwhelming majority of its oil and Iran is the third-largest supplier to the nation of 1.25 billion. Haley said on Thursday she understood India "can't change its relationship with Iran in a day" but said she used a meeting with Prime Minister Narendra Modi in New Delhi to encourage a reassessment. "I also think for the future of India, and the future of being able to get resources and who they're dependent on, I would encourage them to rethink their relationship with Iran," she was quoted as having told local broadcaster NDTV after an address in New Delhi. 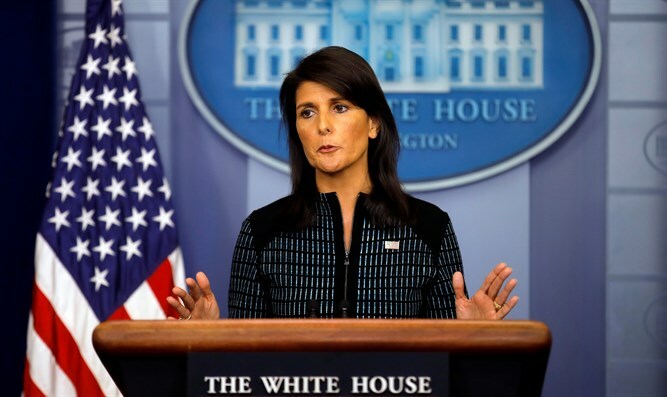 "I think as a friend, India should also decide is this a country that they want to continue doing business with," added Haley. Trump withdrew the United States from the Iran nuclear deal last month, re-imposing sanctions that had been suspended in return for curbs on Tehran's nuclear program. Before the 2015 nuclear deal between Iran and six major powers, various buyers of Iranian oil including India had waivers or exemptions to U.S. sanctions. India's foreign ministry said Thursday however that the Islamic Republic was a "very traditional partner" that enjoyed "historical, civilizational linkages" to India. "She has her views, and ours views on Iran are very clear," said ministry spokesman Raveesh Kumar of Haley, according to AFP. "We will take all necessary steps, including engagement with relevant stakeholders to ensure our energy security," he added. Modi hosted Iranian President Hassan Rouhani in February during Rouhani’s three-day visit to India. Modi said at the time that Iran and India respect each other and claimed that under Rouhani's leadership, the ties between the two countries have strengthened.